The courtways and driveway areas of this apartment complex were designed with Muted Green COLOR HARDENER. The texture was done with Rough Stone TEXTURE SKINS and a special tool that imitates the joint lines. 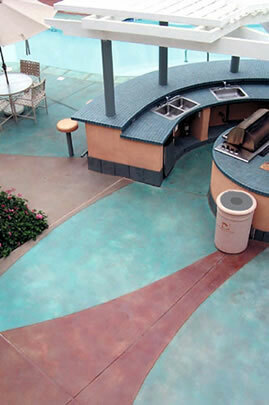 The recoration areas surrounding the pool were cut into sections and then stained with BLUSH-TONE ACID STAIN. The colors used were Turquoise, Caramel, Ebony, and Coffee. Brickform, in Rancho Cucamonga California, offers precision cut stock or custom stencil patterns that are cut into a resilient, self adhesive, sandblast- specific material. 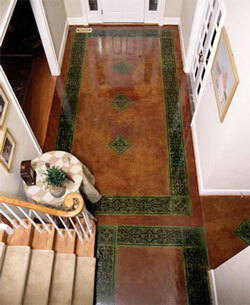 Click here for more information about Brickform Chemical Stain.